For fifteen years we have been on a journey to create a lively venue inspired by good farming, good cooking and good eating – a comfortable place where people gather to eat, shop and learn. We chose a site on North Street in downtown Healdsburg. Next week our dream will reach a milestone when our building’s recycled steel structure begins to arrive on site, to be assembled over the coming months. We call ourselves SHED. When SHED opens this autumn, it will house a café, coffee bar, wine bar, larder, pantry, event gallery and kitchen/garden store. We are tied to our foodshed, the flow of fresh food from local farms to our tables. 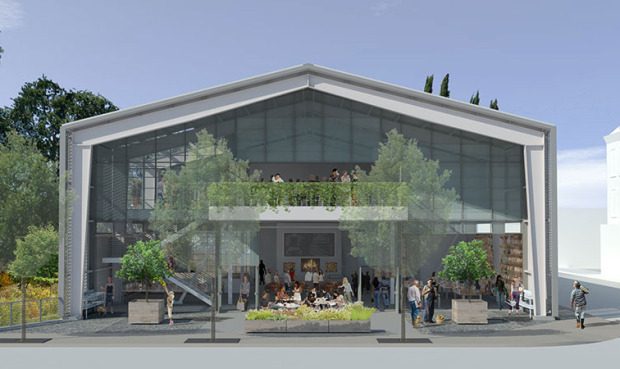 Our café will support farmers by featuring regional, seasonal food with a special emphasis on Sonoma County. We will also source products from talented, local food artisans. We are active conservators of our watershed: Dry Creek, Crane Creek and Foss Creek, all waterways that feed the Russian River and provide habitat for steelhead trout and coho salmon. A restored section of Foss Creek runs along the west side of SHED, protected by the water garden that filters rain falling from our roof. We envision our market as an abundant toolshed offering beautiful, enduring tools for the kitchen, garden and farm. Symbolically, a shed is an enclosure that shelters ideas, sustenance and community. Our SHED will be a dynamic center where locals and visitors gather to learn and share: food crafts and traditions, gardening and farming, sustainable living. 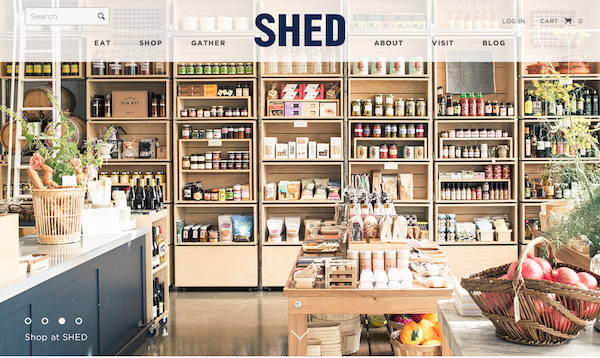 We invite you to follow us on SHED’s blog while we build out our dream. We will set new standards and share old traditions as a café, meeting place, learning center and food/kitchen/garden store.